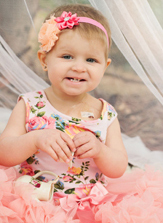 In August of 2015, at nine months old Hazel was diagnosed with acute myeloid leukemia (AML), a type of blood cancer. In November of 2015, she had a bone marrow transplant, but two months later relapsed. Hazel had numerous blood and platelet transfusions and needed additional transfusions as she underwent treatment. Hazel fought leukemia for half of her life, but refused to let it stop her from the things she loved like dancing, singing and coloring. Hazel lost her battle in April of 2017 with AML, and is survived by her mother Lynn, father Tim and big sister Raya. Hazel was a shining light and touched everyone who met her and learned of her story. We are thrilled to keep the memory of this brave fighter. Schedule your appointment to donate blood in memory of Hazel Altbaum.